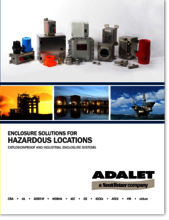 Adalet offers the most extensive line of enclosures and fittings to the hazardous and non-hazardous environment markets. Our engineered enclosure systems include explosionproof and stainless steel junction boxes, motor control enclosures, meter and instrument housings, and increased safety terminal and control enclosures. Our enclosures carry an extensive line of certifications and approvals both domestically and internationally. Below you will find our literature database designed to conveniently provide you with any product information you may need. We have now extended our full product catalog into separate product pages for your convenience as well as provided you with Adalet's most current product brochures and sell sheets.